Bennet replaces Salazar, above, Obama's choice for interior secretary. (CNN) - President-elect Barack Obama Saturday praised Colorado Gov. Bill Ritter's choice of Michael Bennet as that state's next senator, saying Bennet reflects "the qualities of the ruggedly independent state." Ritter officially announced his choice at a Denver press conference Saturday. 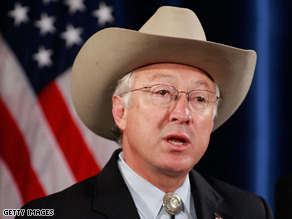 "Filling Ken Salazar's boots in the US Senate is a tall order. But in selecting Michael Bennet, Governor Ritter has made an excellent choice," Obama said in a statement released by his transition office. "Michael Bennet perfectly reflects the qualities of the ruggedly independent state he has been chosen to serve. An innovator in the public and private sectors, he has shown himself willing to challenge old thinking and stale policies," Obama also said. Bennet, the Denver Public Schools Superintendent, replaces Sen. Ken Salazar, Obama's choice to be interior secretary. Ritter had narrowed down his choice to either Bennet or the popular Denver mayor John Hickenlooper, and made his final decision on New Years Day, according to reports. In the news conference Saturday, Ritter said Bennet is "exactly who we need representing Colorado." "Michael has this unique set of personal and professional experiences that make him the right choice for Colorado," Ritter said, according to CNN Denver affiliate KUSA. Susan = I thinks it's safe to say you will never have the problem Caroline Kennedy is having of being appointed to the Senate. Your a Idiot and couldn't run the surplee machine at 7-Eleven. Stop worrying about Caroline and get hooked on Phonics. Idiot. "Clifford" are you the God of Village Idiots? You sure could be one of it's leaders. Clifford my dog is sitting next me as I read your post, and she's you Challenging you to take a I.Q. with her. She swears that she would score higher. I'm so sick of hearing about people's freaking comments not getting posted! Oh, whine whine whine, I'm blocked because my comments are just too truthful for your worldwide news organization to withstand so you decided to block me! Shut up, that comment made it through! Just stop, take your socks off, and count a little. 60-150 comments per thread. Thousands of commenters. Hmmm, is it just me or does simple math make it simply unlikely, not conspiracy, that your comment is gonna make it through everytime? You're so freaking ate up with mantra, you guys are making me hate you. For god's sake, you were given a brain for a reason. Breathe. God's in control, right? Education, intelligence, and competency have returned to America. Thank God.